The environment minister has rejected an application to drill an exploratory borehole for shale gas in County Fermanagh. Mark H Durkan said the decision to turn down the application had been taken "after very careful consideration". Tamboran Resources had applied for permission to drill a 750m deep hole at a quarry at Belcoo. It issued a statement saying it was "deeply concerned" by the minister's decision. Tamboran had intended to drill using "permitted development rights", which meant the firm would not have needed to apply for planning permission. The minister could only veto this if he assessed that work was likely to have "a significant environmental impact". And that is exactly the position he has arrived at. Tamboran will now have to make a full planning application with an accompanying environmental statement, a process that will , conservatively, take months to complete. But it does not mean the borehole will not eventually be drilled. Alternatively, Tamboran may want to try to get a judicial review of the decision, arguing that the minister has not interpreted the planning regulations correctly. "The company is currently reviewing its position and will release a further statement in due course," Tamboran said. On Monday night, protesters against fracking celebrated the decision by the environment minister by holding an ecumenical service at the gates of the quarry. The MP for the area, Michelle Gildernew of Sinn Féin, welcomed the announcement. "The decision to deny Tamboran to begin deep bore test drilling in Belcoo, Fermanagh, is the correct decision given the clear opposition to fracking in the area," she said. 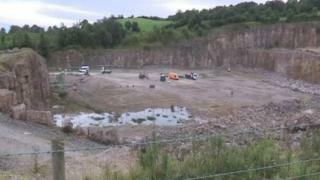 Protesters objecting to both fracking and gas exploration had held a permanent vigil at the quarry. The aim of the borehole was to check if there was enough gas below ground to warrant seeking a licence to set up a fracking operation. Tamboran staff moved into the quarry three weeks ago and carried out work to secure the site. Protesters said they feared a borehole could be the first step towards the setting up of an industry that they believe could damage the environment and the health of local residents. The borehole drilling process would not have involved fracking. Currently, Sinn Féin, the SDLP and UUP say they oppose fracking, while the DUP has said exploration should take place, and any application for extraction should be judged at the time. Last week, politicians condemned a petrol bomb attack that targeted the family home of a Tamboran worker in Letterbreen.